Is Trailer Peeta the REAL Peeta? One subject that’s been debated in the fandom since the theatrical trailer release has been… Peeta. Because we will always want to talk about Peeta, and analyze every last detail about this character. It’s what we do. Relating to this particular debate is whether Peeta’s speech in the trailer is out of character for him (Thanks to Satsumarena for bringing this up in our Trailer Reaction post comments). Our lives were never ours. They belong to Snow and our deaths too. But if you kill him, Katniss, if you end all of this, all those deaths…they mean something. I think the main question is whether we think Peeta would be encouraging Katniss to kill Snow at this point in the plot. Or even broader, if he would ever encourage killing Snow. Considering the blurry objects in the background, I’m assuming this is in Tigris’s basement. At this point, Peeta has struggled with the deaths that his hijacking episode helped provoke, but felt real remorse and sorrow at it. He was suicidal after this happened. This is after the “Stay with me. Always” kiss in the sewers. All of his energy is being taken up with staying in control so he doesn’t hurt any more people. He’s fighting to get back to his “Real” self in the most stressful of circumstances, but you can see the real Peeta is slowly winning that battle. I think…you still have no idea. The effect you can have… None of the people we lost were idiots. They knew what they were doing. They followed you because they believed you really could kill Snow. We know Francis & Co have put book quotes in the movie whenever possible. So why the change? What is it about this reworked version that’s more evocative? And does it make sense for Peeta to say? Well, first of all, I think Trailer!Peeta’s speech fits better for a trailer, and I think it will work well in the film. 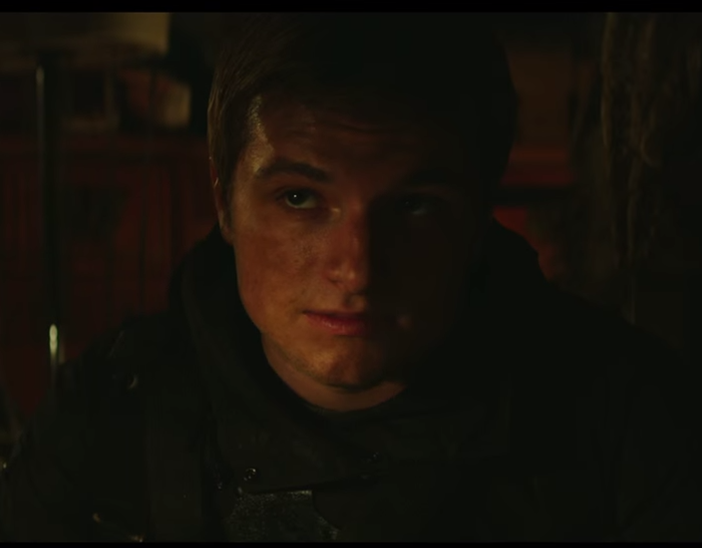 And Trailer!Peeta is raising the personal stakes here a bit. When he says OUR lives, I interpret that as his and Katniss’s lives, how their lives and deaths belonged to Snow from the reaping on. And when Peeta speaks of all those deaths, there’s a cut to Finnick fighting the lizard mutts (SO heartbreakingly good there). The reworked version flows so well. I don’t know why his voice reaches me when no one else’s can. But if he’s right, and I think he is, I owe the others a debt that can only be repaid in one way. And then she makes plans to kill Snow. So what we have here is some nice reworking of the book to help us more clearly see what both Peeta and Katniss are thinking very quickly. Well done. Movie Peeta is Real Peeta. And we can relax. Thanks for your sharing your thoughts, which I essentially totally agree with. It occurs to me that some of this debate is occurring because some fans actually interpret Peeta as a pacifist figure, who’s totally against war and violence. However, I think this is a little too simplistic. Yes he calls for a cease-fire in MJ, but he wasn’t exactly doing so completely of his own free will. Though somewhat ironically, in the movie, Peeta has yet to actually kill anyone. THG completely cut out his involvement in the death of the D8 female tribute, (I know some fans think he didn’t kill her in the book either but I certainly do, that was mostly a mercy kill though it also helped build cred with the Careers, and Peeta essentially asks to be mercy-killed himself in MJ). I also don’t recall any mention of Peeta killing Brutus in either CF or MJ Part 1, at least as far as I recall. So in a way “raring to kill Snow” Peeta is actually more OOC for Movie!Peeta than Book!Peeta. Now of course we can argue that Coin winds up just as much of a Big Bad as Snow at the end, but I don’t think Part 1 really set Coin up that way, it portrayed in a much more sympathetic light than the book did. I saw Movie!Coin’s arc as actually being one where she herself “grows” from brusque but honest military commander, to more of a pandering politician. Whereas I got the sense that Book!Coin, much like Snow, was meant to have been evil all along. Double-posting just to note that the CF movie did HINT that Peeta killed the D9 tribute who attacked him under-water in the BloodBath, but this wasn’t shown on-screen, and I think many movie watchers would have missed that. It’s true that Peeta supports Katniss and never objects to her killing Snow. Also, yes, we don’t have the full movie yet. And his speech is actually very beautiful. So, why does it still feel off to me for Peeta to encourage Katniss to kill Snow? But does disagreeing with Peeta make this OOC for him to say? Not strictly speaking, maybe. Though I think trying to alleviate Katniss’ guilt for tricking the squad (which is what he does in the book), is a bit different from making the killing seem like the ethically right thing to do. There’s also the pacifist thing, which is not some fans’ interpretation, but movie canon. Nina Jacobson states outright,on the commentary track for MJ1, that Peeta is a pacifist. This is to explain his first interview, where Peeta (again, according to movie canon) said what he felt, which the deleted scene also shows. Doesn’t really rhyme with encouraging Katniss to kill, or, you know, generally being a soldier. Or the first movie, where he said he’d be willing to kill in the Games. Hey Louise, I agree that “not disagreeing with Katniss wanting to kill Snow” is quite different from “encouraging Katniss to kill Snow”. I think JJ’s point was, however, that in both cases, this is the effect Peeta’s words have on Katniss, of her feeling encouraged to kill Snow, is the same. And I think her point is that at this point, Peeta and Katniss understand each other enough that if this was the effect, then this was Peeta’s intention, At least in the books. And I also don’t think that SC meant to send a message that assassinating government leaders out of revenge as a good, noble thing young people should aspire to. Note that in this scene, both Katniss and Peeta are under a lot of stress, I doubt either would have considered killing Snow, say, when they were ten years old living in D12. Now, some will say, “but Katniss kills Coin out of revenge” but I personally think, at that point, Katniss had many reasons to want revenge on BOTH Snow and Coin. I think she chose to kill Coin instead of Snow, because Coin was STILL a threat to hurt others, while Snow wasn’t. And it’s not like Katniss personally benefits from her act, whether it was revenge or not. Honoring the memories of the victims of Snow and Coin later on, seems to bring her much more peace of mind. But if your beef is more that a Peeta who encourages Katniss to kill Snow is OOC compared to his movie characterization even if not with his book characterization, then I find this a little more understandable.